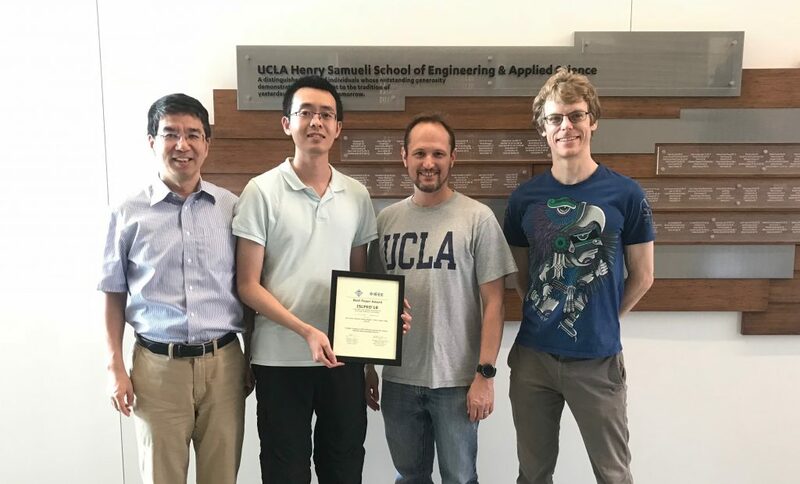 The paper is co-authored by Zhe Chen, Andrew Howe, Hugh T. Blair, and Jason Cong with the title “CLINK: Compact LSTM Inference Kernel for Energy Efficient Neurofeedback Devices.” received the Best Paper Award at the International Symposium on Low Power Electronics and Design (ISLPED’18) held in Seattle, WA, USA during July 23-25, 2018. Dr. Zhe Chen is a postdoctoral researcher jointly supervised by Prof. Jason Cong from the Computer Science Department and Prof. Tad Blair from the Psychology Department. This paper presents a highly energy-efficient electroencephalography (EEG) signal processing accelerator for neurofeedback devices using the long short-term memory (LSTM) based neural network model. It has potential applications for treating neurological diseases such as Parkinsonism and epilepsy using neurofeedback deep brain stimulation. The International Symposium on Low Power Electronics and Design (ISLPED) is the premier forum for presentation of innovative research in all aspects of low power electronics and design, ranging from process technologies and analog/digital circuits, simulation and synthesis tools, system-level design and optimization, to system software and applications. It is co-sponsored by the IEEE Circuits and Systems (CAS) Society and the ACM SIGDA. This year two papers are selected for the Best Paper Award from 150 submissions.